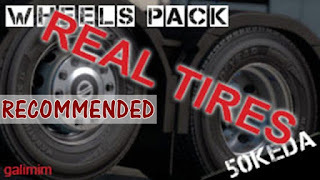 This is a sister mod of my Real Tire addon for 50kedas Wheel pack. It works with both stock and 50k wheel rims. It includes 103 different front and 99 different rear tires from some of the biggest tire manufacturers Goodyear, Michelin, Bridgestone, Yokohama, Continental, Dunlop, Fulda, Hankook and Pirelli! All of the data about tire performance was taken from official websites of said manufacturer. The data used is for the corresponding tire size so even the same tires in different sizes can vary. There have been some changes due to differences between USA and Europe. All tires from European version are still in there, but I have added a new 295/75 tire size with some US only tires. In time, I hope to add more, if I find good resources. The prices for front tires are for set of two and prices for rears are for set of 4. Prices were taken from various internet tire suppliers and may vary from country to country and from website to website.